will suit your home, property and life style. 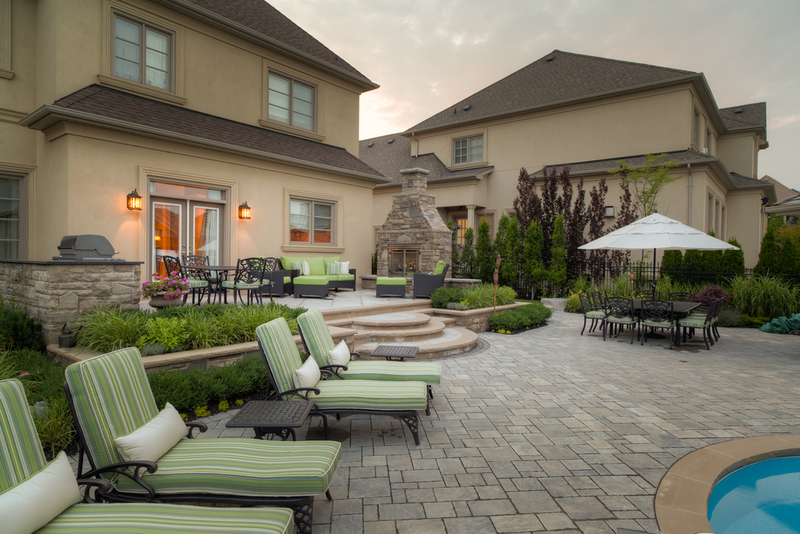 Darsan's landscape designers helped transformed this property into a peaceful retreat. 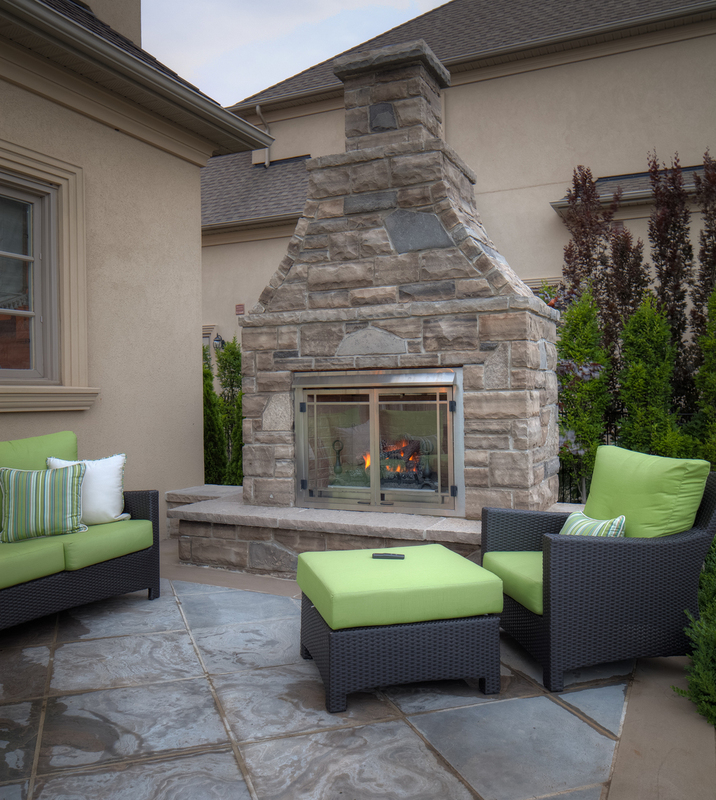 The home owners wanted a space that would allow them to spend quality time with family and friends all in the comfort of their own backyard. Stepping through the elegant French doors onto the combination lounging and cooking area, a custom built fireplace with a gas insert provides a cozy place to sit and relax. On the opposite side is a barbeque stone surround to compliment it. 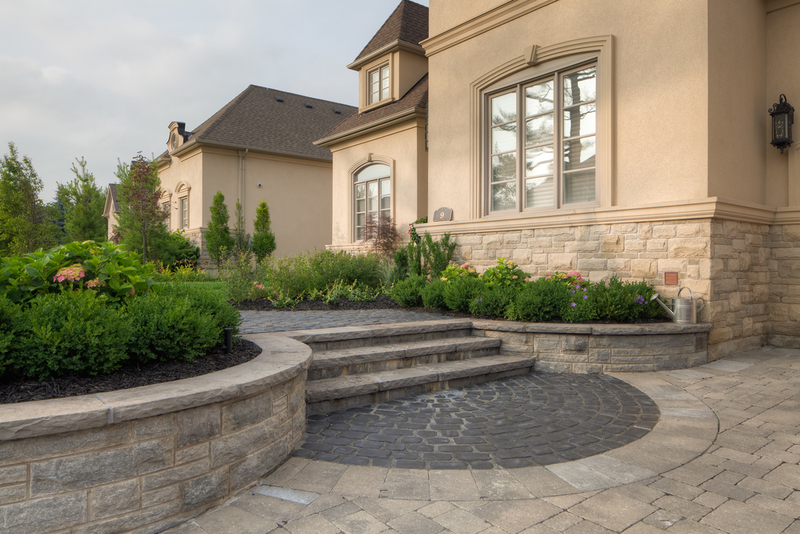 This upper terrace is veneered with Wiarton Eramosa flagstone. Stone planter walls with grasses hugged the terrace. On the main patio level is a curved vinyl pool with Indiana limestone coping. A custom stone diving platform was built into the back side of the pool, still leaving ample room on the Trafalgar pool deck for lounging furniture and a dining table. The spectacular multi-purpose cabana was custom designed and built with a cathedral style ceiling, cedar shingles, stucco and stone finish. The back portion houses a full kitchen and includes custom cupboards, counter space, a full size refrigerator and separate bathroom / outdoor shower. The front portion is open-sided with custom detailed square columns. Drapery is hung to add a sense of privacy while creating a unique personal touch. A surround sound stereo system was installed. Special interest was created with the garden lighting and a variety of plant material. 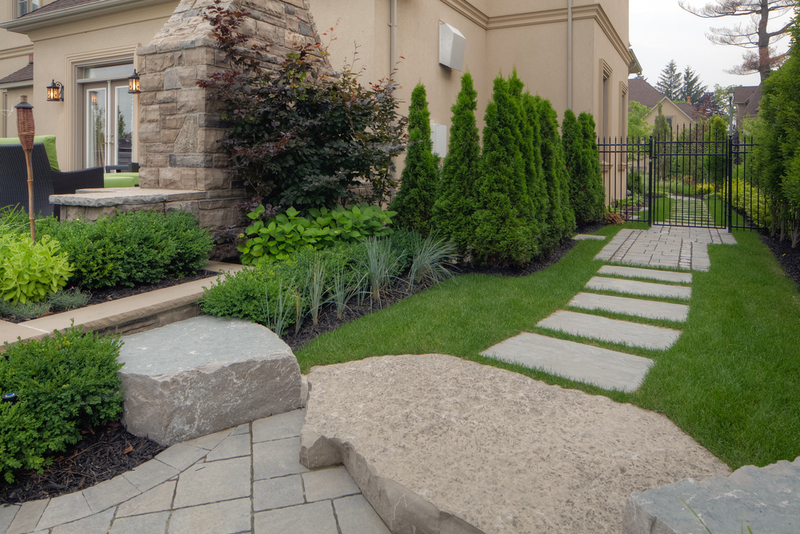 Darsan Contracting spruced up the front yard landscaping with a cobblestone insert on the existing driveway which tied in with the newly built cobblestone walkway that led to the front door. New curved stone planter walls were added on either side of the new stone steps. The plants softened the look of all the stone surfaces.